WindowBlinds 10.74 has been released. You can get it from your account page or using the following link here. Fix for painting issue on Windows 10 insider build. Thank you. It's working perfect now. should i uninstall the current version first or does it matter? Good to have the File Explorer status bar back. Happy that it's pulling a color other than Window Background too. Always uninstall, reboot, install, activate, don't apply any skins and reboot. I would hope that we don't need to run that purge routine just to uninstall for an update. I didn't. I just uninstalled through the Windows Program and Features in the Control panel. Edit: You can install 10.72 without uninstall but if Uninstall is needed/wanted you can do a purge. I did the purge and all went well until the uninstaller came up. After a minute or two it said on top (not responding). So I closed it with task manager, used iobit to finish the uninstall (it had left 7.49 mb behind) the rebooted. I got a black screen, cursor only, during the uninstall and it took a while to come up to the full desktop. After that installed 10.72 beta without any problems. No black screen nor delay in applying another skin. Works. (fingers crossed). BTW: It still doesn't skin Chrome. My uninstaller always says Not Responding with WindowBlinds. You just have to wait. It's sill uninstalling. After a couple of minutes it will respond with the restart screen. It seems the little uninstall screen has a problem. Reset to Windows Default theme. Download latest WB Installer and Install. Always works just fine this way. Windows Drag in Edge is still sticky. Does not work reliably when Edge is skinned. Would like to know what windows 10 version you are on? My Windows 10 V1809. Edge problem on "click and drag" at title bar no longer there. I believe, betas only available for Object Desktop Subscribers. I'm running Windows 10 Home Version 1803. I guess Microsoft changed something on V1809 that solved that Edge issue on Windowblinds. Can someone also on V1809 verify this please. Can someone also on V1809 verify this please. 1809 here... Edge seems to be working fine. I have Object dock subscription don't see the beta ? 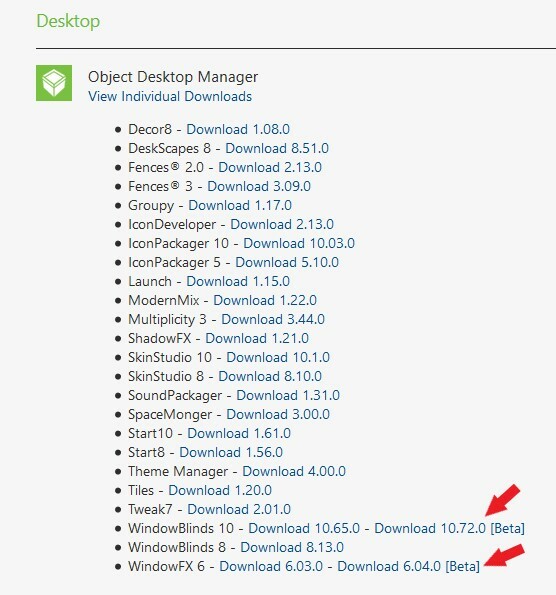 I believe its for Object Desktop Subscription. Not Object Dock. If you actually have Object Desktop and the Subscription still active please let me know so I can check with Support Team.